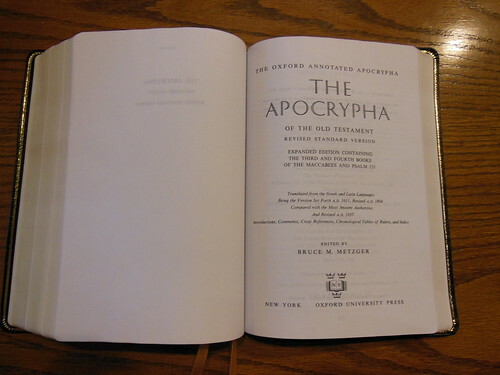 Today on Snyder’s Soapbox we are going to take a look at a Bible for all the RSV and Apocrypha fans. The Apocrypha isn’t my cup of tea, but I recognize there are some folks out there who would like to buy a well built Bible in this translation with the Apocrypha. 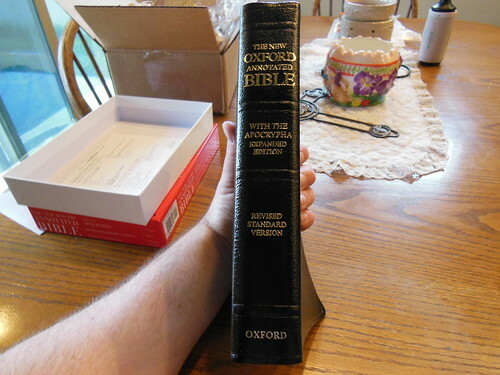 This Bible from Oxford, is very well built. I wouldn’t look at it as a premium Bible, but more as a work horse. The thing is built like a tank. That’s not to say it isn’t an attractive looking Bible, it is. I would categorize this Bible as a daily use Study Bible. 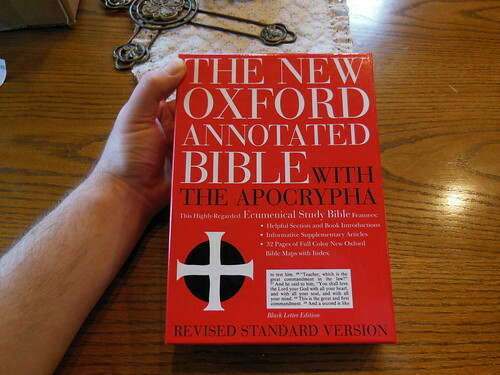 If you want to read the Apocrypha, and the notes that go along with this edition, this is probably the best option. I’ll stick to my own flavor of commentaries. 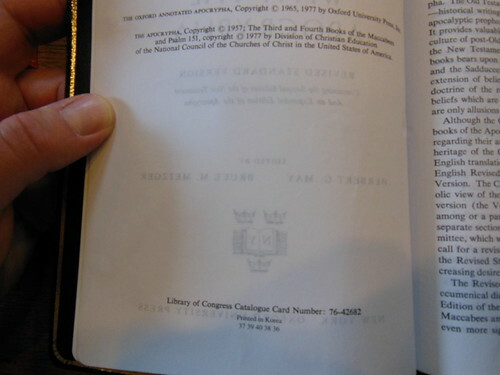 As a Reformed Baptist much of the notes in this edition are generalized for broader appeal. It is covered in black genuine leather with a moderate grain and a perimeter groove. The leather is harder, and high gloss, leading me to think that it is pig skin leather. Pig skin leather holds up well, but is not as supple as other choices. It is also less expensive to use. 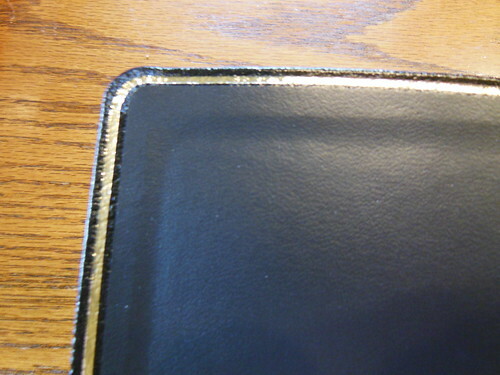 It is case bound, and has a gold colored, hot-stamped, perimeter line around the inside cover. It has two yellow/gold ribbon markers, black and gold bands. 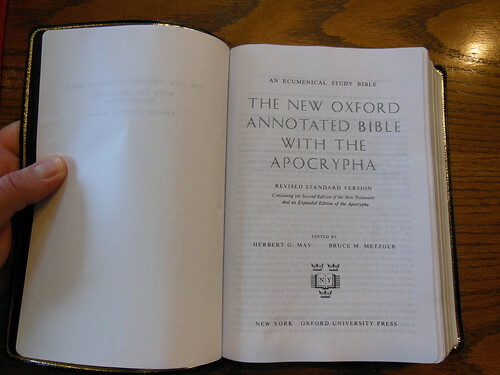 The spine has the words, “The New Oxford Annotated Bible” at the top, “With the Apocrypha Expanded Edition” under that, then, “Revised Standard Version” and, “Oxford” at the bottom. 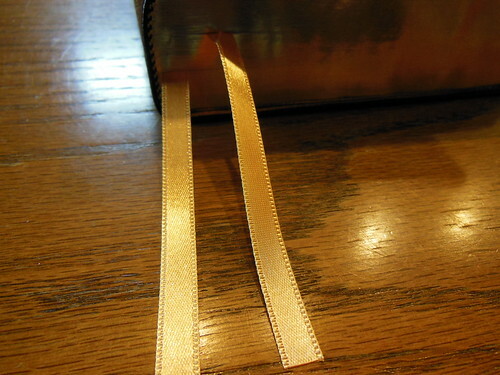 The page edges are also hot stamped with gold colored foil. I really like the ribbons. 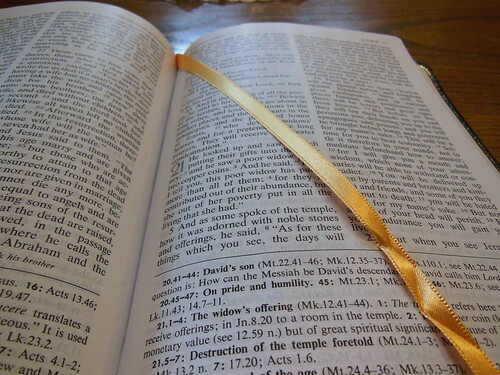 Their color and material, are nice for a Bible with this low price. The spine is smyth sewn, flexible, and durable. 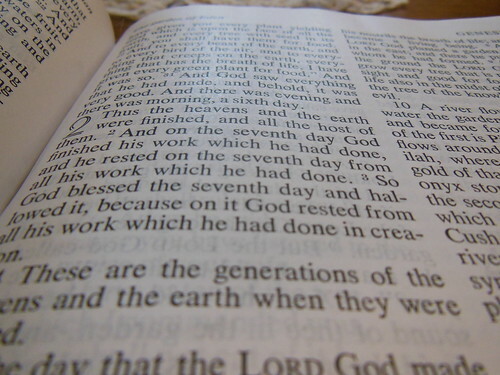 I can’t think of any reason why this Bible wouldn’t hold up for a long time. The paper is thick, opaque, and the 10 pt. font of the main text, is sharp and clear. The notes are in 8 pt. font. 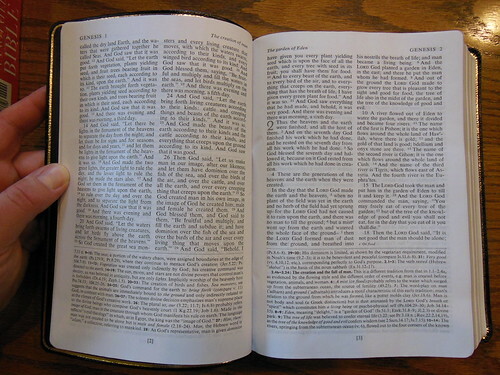 This Bible is printed, and bound in South Korea. It is a quality edition at a good value price. It is laid out in a double column, paragraph format, with notes at the bottom. Each book has an introduction. It seems to be more of a study Bible, than a reference Bible, with all the helps that are in it. At the end of the day, if you are in the market for an RSV, with the Apocrypha, this is the only choice. It is well built, and priced to sell. It should last a long time, and serve you well. Make sure to check out all of the pictures I took of this edition for a better look at the features on my flickr page. This is the product information section from Christianbook.com’s product page for this edition. 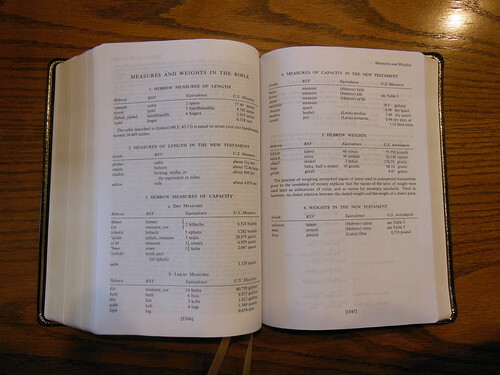 This classic resource is the only RSV study Bible available today. It features extensive annotations to the biblical text, book introductions, eight supplementary charts and essays, and authoritative, full color Oxford Bible Maps. Thanks for the review. I have had this Bible for about 6 months and I really like it. The font is really an optimal size and boldness for easy reading. I also like that there are no section headings in the text itself, but headings at the top of the page instead, leaving the text uncluttered. 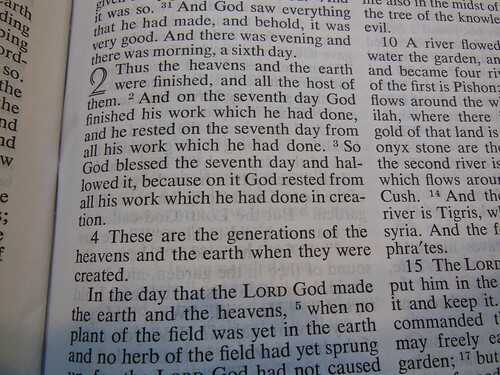 So for that reason, this is a great “reader” Bible. I notice that your copy like mine has a rather creased up ribbon marker. 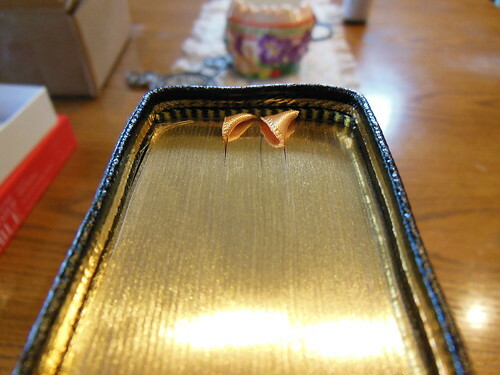 Have you ever attempted to flatten a ribbon out with an iron? I considered using a clothes iron on the lowest setting, but am afraid it would melt and ruin it. Have you ever attempted such a thing? Yes, I have. I used a butter knife that I heated over the gas burner of my range, to put a crease in my ribbons, so they would fold correctly. I would say, test the bottom of the ribbon with a clothes iron. I don’t know how hot they get. If you lay it out the top of the Bible and sandwich it between some thin material, then iron them together it might stop it from getting singed.